Satellites are purely science-fiction. All supposed images of satellites in orbit show fake CGI "satellites" orbiting a fake CGI "ball-Earth." First conceived by Freemason science-fiction writer Arthur C. Clarke in 1945, they claim satellites became science-fact soon after. This is impossible for many reasons outlined in the following video, however, including the fact the melting points of the metals used in satellites are far lower than the temperature in the "thermosphere" where satellites supposedly are. Satellites, space stations, the Hubble telescope and space travel in general are absolutely the biggest hoaxes of the century, and NASA the most successful propaganda organization in history. "The temperatures on the front surfaces of these satellites will go into the high hundreds of degrees Celsius, and beyond." "Designing the systems needed to protect the spacecraft has stretched the minds of engineers." Wooow!!! Didn't our military have the forerunner to the Internet BEFORE we "went to the moon" in 1969? I think it's all radio waves. The answer you are looking for is called "Skywave propagation", which works by bouncing Radio Waves off the Ionosphere. Not sure this answers your question, but I once worked on a salt field, about 1500m x 6000m, where depth measurement was critical (to around 50mm). We thought when we linked up the harvesters to satellites, we would get even more accurate harvests, but what we found was no end of troubles - we couldn't achieve consistent results across the entire field. In the end, we went back to assuming a simple flat plane (no satellites), to achieve the original acceptable accuracy. Not sure if this was just because our satellite linkups were wrong, but knowing what I know now, it wouldn't surprise me if the errors were from assuming the flat earth was round. GPS requires WiFi, Cellular Towers, and Internet backbones to pinpoint your location. accurate timing of the cellphone protocol to work reliably. This News Crew should get themselves some NA$A - Satellite Technology, reducing the size of their equipment. Doesn't the fact that "Satellite TV" companies are hyping up their ability to provide subscribers access to programming anywhere they are with the aid of an "App" proof that they don't use Satellites? What is that big antenna and all that nifty equipment for if you don't have to carry the antenna all around to watch TV where ever you go? Eric, I'm a 38 year old Engineer with Raytheon Australia, a US defence company based in AU. Years of Defence engineering work presently on Naval Weapon Systems, previously aerospace AWAC's and before that Sat Com Engineering for Intel. Lots of stories we could share but when working with Satellite comms I was attempting to work out how we were getting certain comms because they didn't appear to be bouncing off satellites. We have TS clearance, compartmentalised so it is very difficult to stray outside your allocated slice of pie. Anyway, I was promptly told I was "thinking outside me clearance" and pulled into line. Can relate to a lot of what you are saying and I never thought I would so congratulations and thanks for your work. It certainly is a mind blower but I very much understand the power of the media. Would love to get a copy of your book / books, how can I go about that? "...It was May 1990 and the $1.5bn Hubble had been in orbit for a month. In the room at Nasa’s Goddard Space Flight Centre in Maryland, everyone stared at the image..."
“..Some eyebrows went up,” says David Leckrone, a senior scientist who worked on Hubble from 1976 until his retirement in 2009. “It was supposed to be a picture of a binary star, a pair of stars. But it was just sort of a fuzzy blur.” Someone piped up: “It’s OK, isn’t it? That’s how it’s supposed to look?” Those in the know drew breath. That was not how it was supposed to look..."
"...It was Lyman Spitzer, a Princeton astrophysicist, who made the proposal convincing. High above the distorting blanket of Earth’s atmosphere, a space telescope could perform science far beyond the reach of ground telescopes, he argued. His ideas appeared in a 1969 report. Lyman was an extraordinary intellect. He won the backing of fellow scientists, and ultimately the US Congress..."
"...Nasa engineers spent several weeks checking out Hubble’s systems before taking their first picture. The image was a huge disappointment, but Leckrone stayed optimistic. They could adjust Hubble in countless ways from Earth. A few weeks’ work and they would have it working properly, he thought. “Then, some weeks went by and nothing we did made the image much better. Suddenly the mood became very morose,” he says..."
"...Chris Burrows, an optics specialist. “There was an edge of anger in his voice,” says Leckrone. “He said: ‘You’ve got half a wave of spherical aberration and there is nothing you can do about it”. The room fell silent..."
"...The Hubble project was managed by Nasa’s Marshall Space Flight Centre in Huntsville, Alabama. Some Marshall scientists had heard Burrows speak that afternoon. After the meeting, they gathered in a small office to take stock. As Leckrone walked in he heard Jean Olivier, Hubble’s chief engineer, in downbeat mood. “Break out the hemlock, boys,” Olivier said..."
"...Some weeks later, Trauger was at a meeting of the Optical Society when he bumped into Aden Meinel in the buffet queue. They got chatting. Almost in passing, Meinel delivered a bombshell. He knew how to fix the problem..."
"...Though Hubble is nearing the end of its life, its pictures and raw data will keep scientists busy..."
"...Unlike Hubble, the JWST is an infra-red observatory. That gives the telescope the ability to look further back in time than Hubble..."
CGI, Blimps, Planes, Drones, ect. Also radar. They superimpose the radar images over a green screen with either shots from high altitude airplanes or a graphic. We have graphics on the weather on the news in the UK. This may have been covered on a previous comment, but it's all essentially ground-based/sea-based radar systems. Not even 'modern' as such, pretty archaic stuff, it's radars that underpin how they 'do' satellites, weather imagery, cell phone coverage, satellite phone coverage. Under-sea cabling connects the "planet" signals are transmitted from towers on land and at sea as mentioned above, that's how it all works. Then we have silly things like GoogleEarth. Which starts out as a crappy graphic, and merges with images from high altitude airplanes as you zoom-in. im sure google earth is done by drones, or a low flying aircraft, why? because you never see clouds in the images, if it was a satellite most of the shots would be of cloud tops, not the earth. To proclaim that satellites don't exist leaves a rather large gap in the data to reconcile how earthlings receive and transmit HF radio signals via these lights (for lack of a misleading term). Your response doesn't fully address the question i pose i.e. What is the true identity of these fast wandering lights and why do they enable RF communication over vast distances over the plane of the earth? They must be a naturally existing phenomena of plasma with no real hard structure pertaining to them. For the global authority to claim ownership and understanding of their mechanics is to disempower the individual from using these tools of light to his or her own ends by serving creation, and not creator, governments, religions, institutions, knowledge cults. All that matters is that any lights you may see in the sky are not satellites. We are meant to believe that they are roughly the size of a school bus, a relatively small size for an object thousands of miles away, and despite this they still claim we can see them with our naked eye. This is preposterous; if you stand on top of a hill and watch a bus drive away from you, within minutes it shrinks and shrinks until you can no longer see it. The idea that you could see it outside of the Earth's orbit when you can't two or three miles away down the road is a joke. All communications are simply radio wave transmissions. 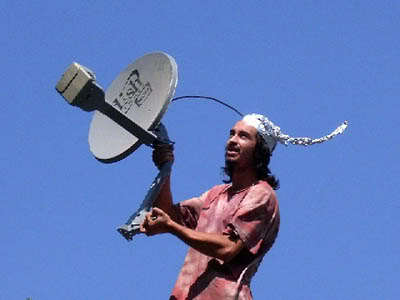 They do not rely on satellite technology. Think about this, when you go into the forest with your mobile phone, it will lose reception. If there were satellites above it in the sky, it wouldn't matter whether you were in a skyscraper packed city or a tree filled forest, the reception should work in both locations, and yet it does not in most woods. That is because your mobile phone needs to be close to a phone tower in order to work. When someone goes missing, they check their mobile phone records by looking at the pings from the nearest phone tower to the person when they went missing. They do not check satellites for information. The concept of the satellite is classic NWO peacocking. They are trying to look more sophisticated than they are, and they are trying to give the impression that they can spy on you wherever you are on Earth. If you have actually read Eric's work and seen his videos, you should realise that it is not possible to send anything (rocket, satellite or otherwise) into space. It's been mentioned that skywave propagation can account for satellites. With 1940's technology they could reach accurately to 1500 miles on open water. Research LORAN. The maximum range that radio signals travel depends on atmospheric conditions, signal frequency, signal broadcast strength and receiver sensitivity. There's already plenty of towers to cover land and with a few AWACS aircraft flying over oceans(who knows maybe they have even turned commercial aircraft into GPS towers now?) they have most every place a person could want to travel covered by now. I see no reason for the need of a different coordinate system either, you use the same coordinates, just the distance between the degrees of longitude will continue getting further apart south of the equator instead of getting closer together. Dont know if this is relevant but I used to lay fiber optic cable and was one of the only ones on the crew who could splice it adequately. I believe all power is integrated with the cables much like telephone cords carry their own electric charge. GPS requires WiFi, Cellular Towers, and Internet backbone to pinpoint your location. the highly accurate timing of the cellphone protocol to work reliably." I tried to use my G.P.S. (Global Pandemic Stupidity) while on a plane and it would not work whatsoever.I thought,this should work no prob, afterall GPS comes from satellites right? WRONG, my GPS came back on the same time my cell started picking up signal again. Interestingly enough, weren't GPS units pushed to the public domain roughly the same time cells started gaining mass appeal? I tried to use my G.P.S. (Global Pandemic Stupidity) while on a plane and it would not work whatsoever. That is very interesting, and very telling; good job. Various claims that most GPS units calculate altitude/elevation from either triangulated position on the corresponding topographic map, barometric pressure, or a combination of both..and..
"GPS fixes are generated in the receiver by measuring the time taken for a radio signal to be received from a satellite. To create a 2D fix (terrestrial) a minimum of 3 satellites must be visible. More accurate fixes are achieved by having more satellites in line if sight of the receiver. Fixes in deep valleys are less accurate or unachievable for this reason. Conversely, on hills or plains fixes are more accurate. Terrestrial GPS receivers can give an altitude based solely on GPS, but generally not accurate because they are optimized to operate to a Datum (which, yes, is a flat but spherical surface). Aero GPS receivers are optimized for giving accurate 3D positional fixes, and are very accurate. Their position algorithm use more satellites to create a fix. By a lucky quirk, more satellites are visible from the air..
Also terrestrial GPS can give more accurate altitude if they have a firm datum for generating that fix. Differential GPS being one example. Sounds to me like all of the "satellites" could very well be on the ground, if not then why are more "satellites" visible from the air for Aero GPS? A lucky quirk, wtf? Yes, just replace every instance of the word "satellite" with "cell tower" and you've got it. I was chatting to a friend that has always been slightly interested in 'conspiracy', he has watched several things about 9/11 and other more "public conspiracies" such as the "moon landing" - so definitely has an open mind. I lifted the lid on FE to him about a week ago, and he has been reading and watching Eric's videos to get caught up. Now he works for a communications company and travels out to places in the middle of nowhere to fix, install and repair radio equipment/phone lines. So it's policy that he has a working satellite phone on him at all times, in case something goes wrong or someone needs to contact him. So as soon as I brought up the idea of satellites being fake, he said "you know what, that is funny because even when the satellite phone says 'there at 20+ satellites above you' sometimes you still can't make a call". At first he thought it was just his phone, but he also mentioned there have been several occasions where there have been other staff on site, who could also not make calls from certain locations. The fix? Move to a higher location, or out of the "black spot". Now if we play the "ball earth game" and say it's the angle of the satellite, blah blah blah, sure there might be a few black spots - but as he said, there is never "less than 20" satellites over ahead at any given time, according to the phone".